The Consistent Options Income trade that was published in 2008 was all about trying to create a high probability strategy that could turn accumulated wealth into a regular monthly income. However, I have had many inquiries over the years about how one could accumulate the wealth to begin with. The Guns & Butter trade is my answer to that question. It is how I attempt to accumulate and grow wealth. The perspective is longer term and the trading approach can put a lot more money to work. If you are looking to compliment your income trading approach or just want to put some money to work, this is a great strategy that should outperform the indexes over time. It is also very easy to manage monitoring as little as once per trading day. In the world of Economists, the Guns & Butter Model attempts to describe the relationship between a nation’s spending on the military and it’s spending on civilian goods. A nation’s objective is to strike a balance that provides for a prosperous yet secure economy. In a Trader’s Economy, we want to strike a balance between holding financial assets (Guns) and selling premium (Butter) so as to provide a prosperous yet secure portfolio. 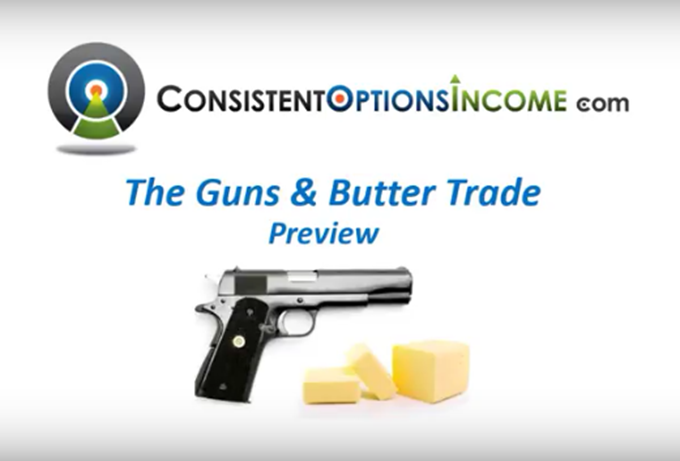 What is the Guns & Butter Trade? But How Do We Manage It More Efficiently?